Swimming went through a frantic year in 2009. It featured the showpiece of the sport, the 13th FINA World Championships in Rome, but it was dominated by an ongoing pursuit of world records, powered by swimmers wearing high-tech swimsuits that arguably contributed to the biggest rush of records in the history of the sport. And record rushes are nothing new to swimming – because swimming is such an inefficient activity (even for the elite), any changes that make even a tiny difference to efficiency (which we’ll define as the speed in the water for a given force of muscle contraction, as poor a definition as that is), make a big impact on swimming times (a relatively larger impact than on sports like running or cycling). For example, deeper swimming pools, wash-off areas that prevent the return of waves from the side walls, and full length body suits have all contributed to step-wise reduction in records. 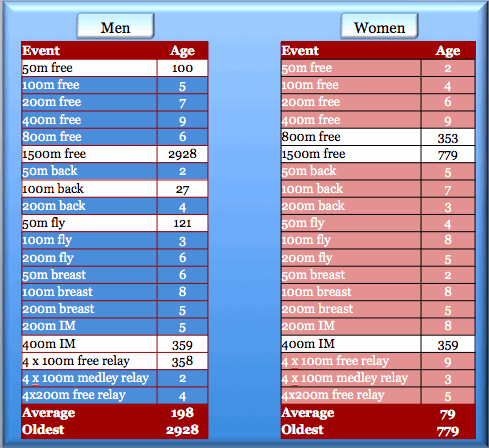 You see this if you look at the progression of records – periods where little happens, followed by a sudden spate of records, then dormancy, eruption and so on (for example, the introduction of swimming goggles some 30 years ago allowed swimmers to see the wall and spend more time in the pool training, causing a sudden drop in times). However, 2009 introduced a new character, or villain – polyurethane. First introduced in 2008 by Speedo in its LZR Racer, the first generation suit was developed in collaboration with NASA and the polyurethane was reported to have zero resistance in wind tunnel tests. The LZR Racer shook up the Beijing Olympics, helping its swimmers to 25 records in the Cube pool. Rome, for example, produced an astonishing 43 world records. The previous record had been 29, back in 1976 when doping was the likely driving force. Out of 20 men’s events, 14 world records fell. On the women’s side, it was even higher – 17. The result was that on the day that the curtain fell on Rome, the average age of men’s world records was 198 days, while women’s records were 79 days old. The table below summarizes the age of the records. Changing the nature of competition? On a more micro-level, upsets and unpredictable results were the order of the day, and this was one of the problems with the suit – it cast doubt on whether a race outcome was ‘genuine’ or assisted by technology, and that is good for no one. Not for the swimmer who is beaten, the swimmer whose world record is broken, or for the new champion, whose title is forever marked by an asterisk indicating “soon to be illegal suit”. Two such swimmers were Michael Phelps and Paul Biedermann. Phelps you know – no introduction needed. Biedermann is not as well known. The German swimmer was previously an Olympic finalist, but while Phelps was rewriting the record books in Beijing, he was, in a manner of speaking, filling a lane alongside the record act. One year later, he improves by 4 seconds and claims the world title over 200m and the world record of the greatest swimmer ever, amidst claims of unfair result and lucky win. The problem is – he may have deserved it. Phelps did swim slower than in Beijing (by 0.22s) and Biedermann’s improvement is large but not impossible. Perhaps in an ‘equal race’, the result would have been the same? But we’ll never know, and the technological imbalance created by the swimsuit wars means the result will forever be questioned. FINA, the sport’s governing body, eventually acted, deciding that all suits would be banned from January 1st, 2010. This means, of course, that there are two days left in this era of swimming. Then it’s back to the pre-2000 suit – knees to navel for men, knees to shoulder straps for women, and polyurethane will be condemned to swimming history. Part of the problem for FINA was that eventually, the voice of dissent became so loud that they had to act. Swimmers like Phelps, through his coach, began to threaten to boycott races given the debacle, while others voiced their displeasure, mainly because sponsorship restrictions (and loyalty) prevented swimmers from racing in the ‘best suits’. And while many will question this, I can certainly relate to the swimmer’s predictament – remember, these are swimmers, not football players, basketballers, or golfers, where sponsorship earnings can be enormous. For a swimmer, it’s often the suit manufacturer alone, and so the commercial problem on the ground was disproportionately large. For FINA, the signs were there in early 2008, but they were slow to act. At that stage, Arena had tried to have the Speedo suits banned, but FINA held firm and Beijing was a Speedo showpiece. The wheel turned and Speedo then found itself on the receiving end. I wonder what the commercial incentives might have been for FINA, given that Speedo are their partner sponsor? There is also a cost issue – at hundreds of dollars per suit, and given that the suit lasts only a handful of races, many decried the impact it would have on the development of the sport. In my opinion, this was not a great factor – it’s easy to ban high tech suits for swimmers under the age of say 16, and ensure equal races. To me, the bigger issue is the equality of competition – are we seeing an equal race between swimmers, where the technology has a negligible impact on the outcome of the race? For tennis, and running, that is the case. For swimming, it did not seem to be, making swimming in 2008 and 2009 resemble Formula 1, where the equipment has a bigger impact on performance than the natural difference between swimmers. The number 1 story is to follow! This post is part of the following threads: News/Controversies, Year-in-Reviews, 2009 – ongoing stories on this site. View the thread timelines for more context on this post.